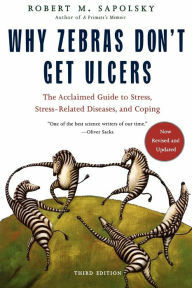 In this humorous and informative book, Robert Sapolsky explains how and why stress affects our bodies. The premise is that prey animals like zebras use a stress response in an evolutionary sensible way by upping certain hormones while they are being hunted, but then the zebras’ stress levels drop again when they escape. Humans have the same bodily changes, only our stress tends to be small amounts for long periods of time, meaning the effects on the nervous system (lower digestion, higher blood pressure, reduced growth, etc.) remain continuously activated. Therefore, human stress is not sensible from an evolutionary standpoint. Each chapter in Sapolsky’s book covers a different bodily system and explains in detail how and why stress affects it. He ends with a rather lengthy description of how lower socio-economic status affects our bodies. Although this section was interesting, it seemed a bit lengthy and out of place from the rest of the book. The subject could be a book all on its own. One thing I loved about this book is it’s approachability. It was easy to read and made me laugh several times each chapter. Sapolsky has an excellent dry sense of humor. He also included a picture of baboons smack in the middle of his book for seemingly no reason. That made me laugh as well. I was listening to his companion set of lectures Stress and Your Body concurrently, though I dropped behind and still have several lectures yet to finish of the course. You can see some details of the information covered in the book and lectures if you check out the above link. In hindsight, although both were enjoyable, only one or the other was necessary as most of the material was exactly the same – even to the wording. This is a very stressful book to read, so watch out if you are prone to stress. (For another theory about why stress evolved, you can check out my review of the Noonday Demon by Andrew Solomon). This is a book that might benefit me. I do not handle stress as well as I could be handing it. I tend to deal with issues through books. It is time that I did some reading on this. Well, if you're looking for a self help book, this isn't it. This is a book about how stress affects the body with very little cogent advice on how to deal with stress. But it's a great book! He did have a chapter at the end explaining how to reduce stress, but it wasn't anything particularly new or enlightening, and it wasn't the point of the book. Yes, it was stressful to read, but I'm generally able to set that sort of stress aside. I have so many other stressors to worry about.